The all-new E-Series 24″ (23.54″ diag.) 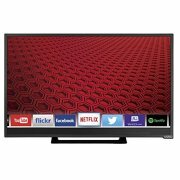 Edge-lit Razor LED Smart TV features an ultra-slim narrow, crystal-clear LED-lit picture, and a faster, easier-to-use Smart TV experience with built-in Wi-Fi. And not only is it smart, this TV is packed with the latest technology – like Razor LED for a brilliant picture in an ultra-thin design and Full HD 1080p for crystal-clear high definition resolution. VIZIO E-Series: Picture-Perfect, Simply Smart.